All children are a blessing, yet so many parents take them for granted or treat them as an inconvenience. I myself have been guilty of this. Never have I treasured my “Mommy Moments” more, than I have since the loss of my third baby. I have found myself losing perspective many times over the past few years but when I think of Faolan, I am reminded that one cannot chose who gets to stay or who gets to leave this world. Jesus is the giver and taker of life. And even though I don’t understand his thoughts or reasons, I know that he wants what’s best for me. I have seen it over and over again since that day three years ago. Even though he took my baby, he gave me a constant reminder of his blessings. My daughter. Now, every time she wants to sit on my lap or read a book, I find myself stopping to spend time with her. I take the time to ‘play’ because I can. Nothing else is more important than investing in the lives of the three little people under my care. I don’t deserve her but I am so thankful that God saw fit to give me a blessing, a rainbow, to remind me of his grace despite my unworthiness. I have learned to be kinder with my words to those who have suffered loss, infertility or those struggling through a trial. I have learned to re-think the cliche phrases that society throws at us in our time of pain. I have both said them and have been on the receiving end. But most importantly, I have learned to pray for those experiencing these types of pain. Although we can’t take the hurt away in a single phrase, laced with sympathy, I can pour out my heart to the Creator, the only one who understands and can heal the cracked pieces of a Mother’s heart. So today, Ponder your blessings! The pages were torn from a journal of handmade paper with flowers pressed into the pages. This paper takes paint beautifully and I am loving how it doesn’t wrinkle or shrink quite as much as papers that I have previously worked with. I am thinking that I will not return the pages to their original binding but will instead think of something else when the time comes. I know, I am procrastinating again. 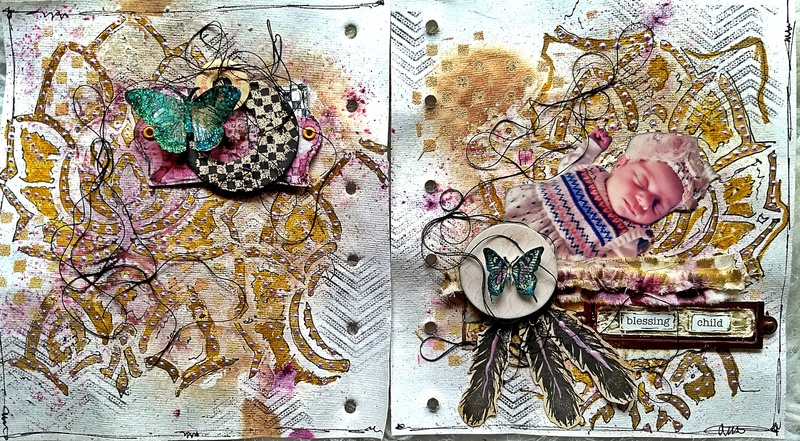 I used Lindy’s sprays in the background as well as PaperArtsy Infusions. I stenciled the Lacy Lotus Repeat Stencil by StencilGirl and colored it in using Distress Paint. I also stenciled a checkerboard stencil and embossed it. The background has been stamped with a Chevron by Unity Stamps. The photo is one of the first’s that I have taken of my daughter. 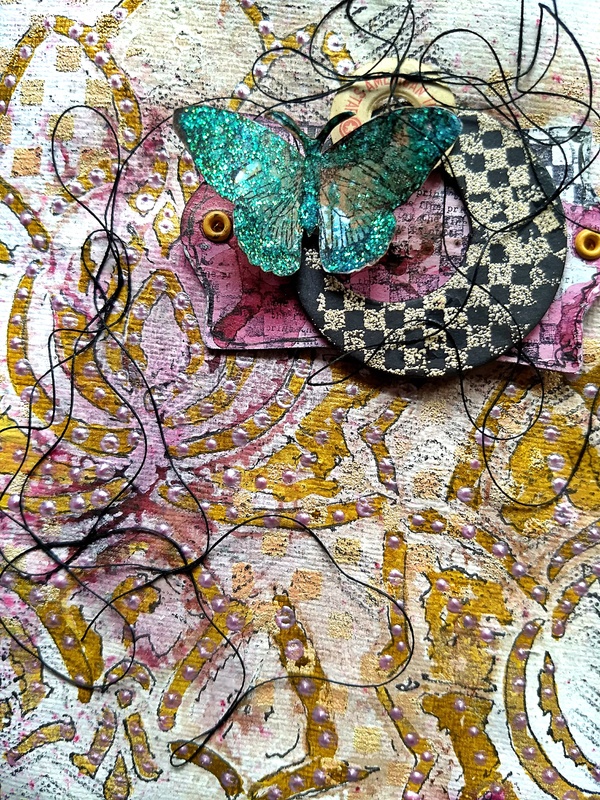 I used some fabric scraps, chipboard, thread and stamps to embellish. Your words are some ot the most touching and poignant I have ever read. Thank you so very much for sharing your innermost, heartfelt feelings with us. They are things that we all as mothers sometimes forget. Every moment with our children is the most precious we will ever know. Pause, listen and take to heart these special times and keep them forever in your heart. Thank you, Susan. You are right, pausing and listening during these times is more important than the rush of everyday life. Thank you for stopping and sharing. This is both a heartbreaking and uplifting post all wrapped into one. Sadness has given way to joy and happiness, and I really LOVE this latest journal you have started for your daughter. I know she will appreciate it when she is older, too. This first spread is beautiful and heartfelt. 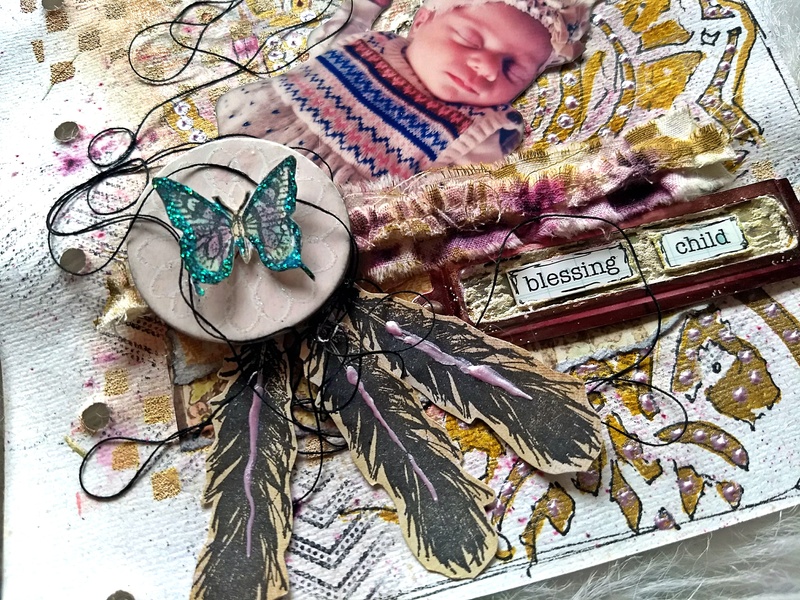 She is adorable and I can tell it is going to bring you two even closer together as you complete this wonderful journal for her. Counting our blessings is such an important thing to do but how many of us forget. Sorry for your loss. Your art is a beautiful celebration of your daughter. A wonderful idea to start a journal to thank god for your lovely little daughter! An AMAZING spread!!!! So full of texture and thoughts! Dear Kate. Reading this post was both heartbreaking and heartwarming at the same time. I am so very sorry for your loss but also thanking God that you have your other children, they must be such a Blessing to you. We forget at times just how precious children are and I agree, we really need to take the time (no matter how old they get) to be with them and appreciate what we have. Blessings to you all. Your journal is beautiful! How sweet and precious is your little daughter and what a wonderful idea to dedicate a journal just for her. It will not only benefit you but she will be able to look through this as she grows up and relive those wonderful memories. Such beautiful colour and texture and I love the feathers! Your words brought tears to my eyes, Kate. How you’ve endured the loss of child but held firm to your faith in the Lord. What do the poor people who don’t have the gift of faith do? How can they deal with such loss? The book you’ve started for your blessing child is lovely and will be treasured I’m sure. Lovely! Thank you for playing with us at Lindy’s Gang! Kate, your words are so heartwarming. I feel for your loss and also feel for the love you have for those other three precious babies. hold them close and love them well. they grow so fast and go on with their own lives, so savor every moment with them now.